Is Trump about to announce a new chairman of the Joint Chiefs? 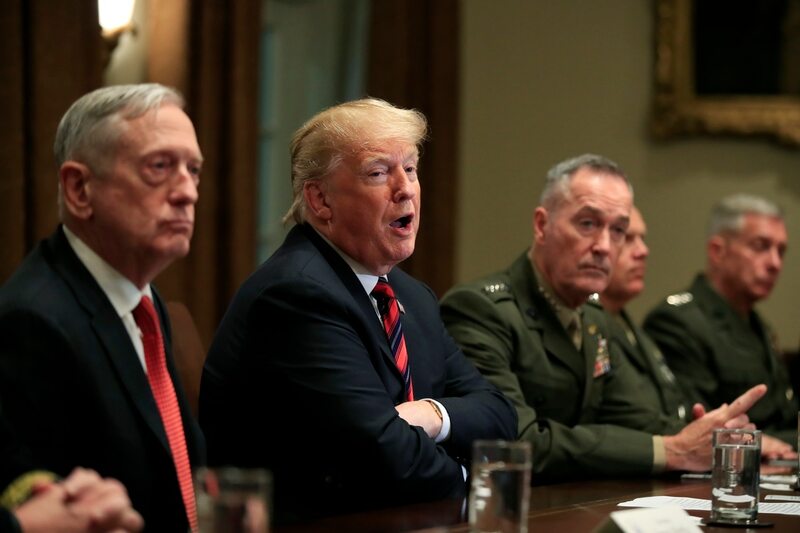 WASHINGTON — In a move catching the defense establishment off guard, President Donald Trump told reporters today that he’ll be making an announcement on Saturday concerning the Joint Chiefs of Staff. Trump, who often likes to build drama and suspense by teasing his decisions, was making a series of personnel announcements on the White House lawn before dropping a tease for another one, to come during Saturday’s Army-Navy game in Philadelphia. "I can give you a little hint: It will have to do with the Joint Chiefs of Staff and succession,” the president said. That the announcement could come at the Army-Navy game set off speculation that Army Chief of Staff Gen. Mark Milley, who has reportedly impressed Trump in meetings, could be announced as the next chairman. Gen. Joseph Dunford, the current chairman of the Joint Chiefs of Staff, will be done with his second term in summer 2019. Dunford was nominated to the post in 2015 by former President Barack Obama, and Trump nominated him for a second two-year term last year. However, it is also possible the announcement will be focused on the vice-chairman spot, held by Air Force Gen. Paul Selva for the last four years. The Joint Chiefs are in the middle of an unusual cycle, where all four service chiefs, as well as Dunford and Selva, are scheduled to be replaced in a very short period of time. There has been speculation in the press that Selva could retire early to clear a spot for his successor to come in and ensure continuity between the current chiefs and the incoming group. Based on the traditional rotation of service leaders for chairman, the Air Force should be up for the top spot, with service chief Gen. David Goldfein the obvious choice. But should Trump decide to eschew that tradition and go with another service, the vice spot may remain with the blue uniforms — perhaps in the person of STRATCOM head Gen. John Hyten.